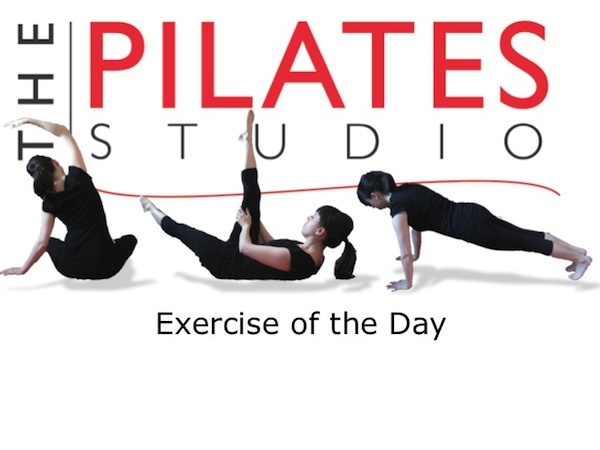 This exercise is a classic pilates exercise. It is a challenge and provides great strength to the body. To do this exercise you will need a mat. Start by lying on your back with your legs stretched long beneath you. Inhale as you float your arms into the air and then exhale as you press your hands to the mat to lift your head, neck, and shoulders. Continue the exhale as you also flex your feet, reach through the heels, connect your sacrum to the ground and allow your legs to float into the air. Then begin the sniffing breath while pumping the arms quickly. Continue pumping the arms through ten breath cycles and then release the body back to the ground. If you have osteoporosis you should skip this exercise, but please check The Pilates Studio’s weekly blog. October 2012 was dedicated to Osteoporosis workouts. You can also see the playlist of osteoporosis friendly workouts on our youtube channel ThepilatesstudioHD. It is so important to use your deep abdominals to glue your sacrum to the ground during this exercise. This will give the body the leverage to lift the legs. Even though the spine is flexing you want it to be as long as it can be!